Gallup: Romney 43% Is At McCain’s Pre-Palin Level. Game Change VP Needed? At Real Clear Politics, the Gallup tracking poll has Mitt Romney at 43% against President Obama and declining. 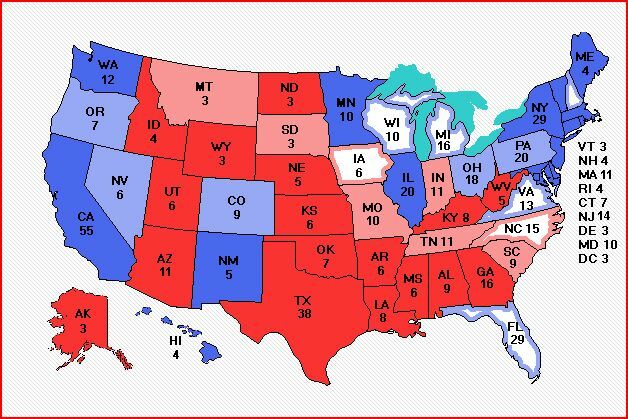 Although in the Electoral College (the latest map from Electoral-Vote.com is illustrated below), Romney has never been ahead, he is currently a massive 114 EC votes behind, and he has previously been up to 5 points ahead of Obama in the tracking polls. To go from 55% to 43% in a matter of weeks is a poor indicator for the Romney campaign, with the usual caveats – “polls don’t count this far out, people are not paying attention, and etc. Be that as it may, when the McCain team sank to 43%, they considered what they might do to fire up the base and lift their numbers. They certainly did not turn to a “boring white man,” and it beggars belief that if they had chosen Romney or Pawlenty, McCain would have passed candidate Obama in the polls as he did after Palin was chosen. The history of the McCain campaign, including of course, Palin’s dramatic entry and McCain’s subsequent rise from doldrums to leader, is brilliantly set out AT THIS LINK. Further, the polling history from Gallup in 2008, chronicling McCain at 43% then rising to being in the lead, and the reason for his loss is set out under the map below this post. It may be that the Romney team will go the “no drama” route and hope that either the economic situation does for Romney what it did for Obama or that the base will turn out,with eyes closed, having someone else help them to put their tick next to Mitt and vote for him because of their “anyone but Obama” imperative. Both of those situations may not happen. The economy might just dawdle along enough, the bully pulpit and the assistance of the leftist media might play their traditional roles, and libertarian Ron Johnson might take enough conservative protest votes to give Obama another term. One thing is certain, though. If Romney chose Palin (if she would accept the role of course) or a “Palin,” then he would get an immediate lift in support from most of the base. The enthusiasm for “Palin” would be palpable, as it was in 2008, and the negatives from 2008 would not come into play this time. Everything the left could possibly dig up, make up, and vomit up against Palin has been dug, made, vomited. Every aspect of her and the life of every member of her family has been dissected and distorted. The public is no doubt tired of the imitators and the “I can see Alaska” shtick is tired and forlorn. No, this time around, the media would have to report on Palin’s actual words not the caricature they make of her. Romney can play it safe and possibly suffer a worse defeat than McCain, or he can go for a game changer. History will show how his first “executive” decision turns out, but he has the option now to gain the base. Between Sept. 4-6, McCain and Palin actually overshot the Obama ticket by 3 percent, with the Republicans in the lead at 48 percent and the Democrats at only 45 percent. McCain consistently held that lead until Sept. 15, and then the candidates balanced out, with Obama enjoying a mere three-point lead, and no lead at all from Sept. 22-24, when the numbers were tied at 46 percent. Some were intrigued as to how McCain’s decision would play out in the polls, but once he suspended his campaign in late September, he never recaptured the lead he enjoyed with the breaking news of recruiting Palin. It was downhill from there. McCain’s campaign was taken out of suspension, but it never actually got back off the ground. From that point, the gap between McCain and Obama only widened, leaving the Republicans at a severe disadvantage. McCain’s numbers remained steady around 42 and 43 percent throughout October, but Obama’s continued climbing, and by October 31, McCain’s standing had dropped to 40 percent, and Obama’s had reached 53 percent – a devastating 13-percent gap. Just who is running the GOP’s campaign at the moment? Is it the putative candidate Mitt Romney, whose Massachusetts health care bill is an acknowledged precursor to Obama care? 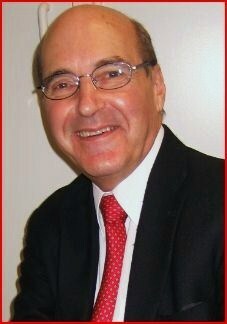 Or is it Sarah Palin that the rank and file look to for advice and taking the battle to the opposition with credibility? Palin has been on Greta,The 5, and Hannnity since the ruling, and numerous comment sites/media outlets have analyzed her thoughts on the matter. Romney’s – not so much. Sarah Palin is more qualified to be the conservative spokesperson on the SCOTUS decision, as she is unencumbered by the history that Mitt Romney has. Here is her interview with Greta on the vital subject, followed by a commentary from BrianusBerkleianus, a commenter at Conservatives4Palin. Note that “treachery” signifies betrayal of one’s own side; it signifies treason. We expected the four Leftist Justices to side with obama, pelosi, and reid. Therefore, it is the supposed “conservative” John Roberts, principally, who is the treacherous one. The other 50%, who think they are getting a free ride, will have less availability of healthcare; fewer choices; less efficient and more bureaucratic healthcare–it will be RATIONED.” (emphasis mine)–This last statement goes right to her famous “death panels” phrase. She did not explicitly wield the words this last evening, but she implies them here!! THEN SHE HURLS THE GAUNTLET IN obama’s TEETH AS ONLY SHE CAN!!! Also, IMHO, I suspect John Roberts of playing a sneaky double game in support of BOTH WINGS OF THE GOVERNMENT PARTY that is opposed to Sarah’s nascent concept of a Party of Freedom. Namely, Roberts saves Obamacare for the Left, but also cynically figures his decision will rouse up enough conservatives to “hold their noses” and vote in Romney in November. He thus helps the entire Establishment, Left and RINO. Mitt Romney advises that “on day one of his presidency” he will remove Obamacare. In actuality, it is Palin, not Romney, who has credibility on the issue – even President Obama pointed to Romney’s Massachusetts health care law instituted by him as a precursor to his own law. Nothing needs to be added to Palin’s statement below – “Congress has the power to rescind a tax” – apart from the musing that perhaps there is still time to change candidates for the GOP nomination. Governor Palin summarized the outcome of the Supreme Court decision on Obamacare in four words this morning: “Obama lies; freedom dies.”. Expect her to elaborate on Greta’s show tonight at 10 PM EST. The key remarks from Senator Barrasso are towards the end of the video in direct response to the question (from an MSNBC commentator) about death panels where he pointedly remarks about “faceless bureaucrats’ in respect of cost management leading to denying proper care. Governor Palin’s complete post on the subject follows below without the MSNBC filter. The Hill has the comments detailed below from Senator Barrasso in respect of Sarah Palin’s renewed attack on the Obama administrations health care law including her terming an aspect of the law as ‘death panels’. Palin was roundly criticised by the left, but it is generally agreed that her attack on the Obama admin’s proposals created a massive resistance to them and may have been one of the major contributing factors to the Tea party movement which led to the GOP takeover of the House in 2010. Senator Barrasso is vehemently opposed to the law and his opinion carries extra weight as he is a medical professional as well as a lawmaker. The whole The Hill article is AT THIS LINK. Sen. John Barrasso (R-Wyo.) said Wednesday that a portion of the controversial healthcare overhaul legislation that’s designed to control Medicare costs will result in the denial of care for patients. “Though I was called a liar for calling it like it is, many of these accusers finally saw that ObamaCare did in fact create a panel of faceless bureaucrats who have the power to make life and death decisions about health care funding,” she wrote on her Facebook page Monday. As we wait for the impending Supreme Court decision on Obamacare, I reiterate what I wrote in myfirst post onthis topic nearly three years ago. I stand by everything I wrote inthat warning to my fellow Americans, because what was true then is true now, and it will remain true as we hear what the Supreme Courthas to say.Itwas a pretty long post, but a lot of people seem to have only read two words of it: “death panel.” Though I was called a liar for calling it like it is, many of these accusers finally saw that Obamacare did in fact create a panel of faceless bureaucrats who have the power to make life and death decisions about health care funding. The Democrats promise that a government health care system will reduce the cost of health care, but as the economist Thomas Sowell haspointed out, government health care will not reduce the cost; it will simply refuse to pay the cost. And who will suffer the most when they ration care? The sick, the elderly, and the disabled, of course. The America I know and love is not one in which my parents or my baby with Down Syndrome will have to stand in front of Obama’s “death panel” so his bureaucrats can decide, based on a subjective judgment of their “level of productivity in society,” whether they are worthy of health care. Such a system is downright evil. Healthcare by definition involves life and death decisions. Human rights and human dignity must be at the center of any health care discussion. Rep.Michele Bachmann highlighted the Orwellian thinking of the president’s health care advisor, Dr. Ezekiel Emanuel, the brother of the White House chief of staff, in a floor speech to the House of Representatives. I commend her for being a voice for the most precious members of our society, our children and our seniors. We must step up and engage in this most crucial debate. Nationalizing our health care system is a point of no return for government interference in the lives of its citizens. If we go down this path, there will be no turning back. Ronald Reagan once wrote, “Government programs, once launched, never disappear. Actually, a government bureau is the nearest thing to eternal life we’ll ever see on this earth.” Let’s stop and think and make our voices heard before it’s too late. Here are two recent photos that Bristol Palin posted on her blog here and here. 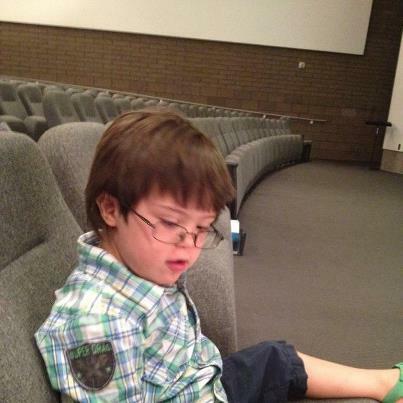 This adorable photo was taken of Trig at Vacation Bible School in Alaska recently. He seems to be looking intently at some VBS materials. Notice the fashionable eyeglasses – quite becoming for one this age. 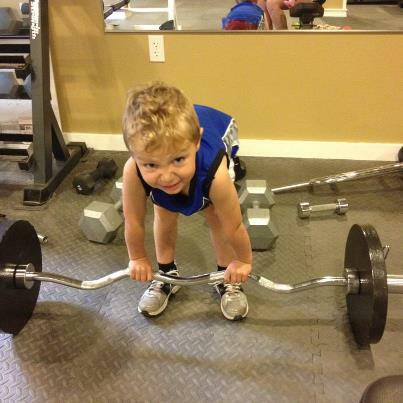 Here is a photo of Tripp pretending to lift a heavy set of weights. This adorable toddler has a spunky personality, as you may have seen in the ‘Life’s A Tripp’ episode last night when Bristol and Willow egged him on to “show his muscles” to the paparazzi who were taking pictures of them.